Solomon Abegaz of EIAR, co-principal investigator of ACGG in Ethiopia (photo credit: EIAR/Semunigus Yemane). 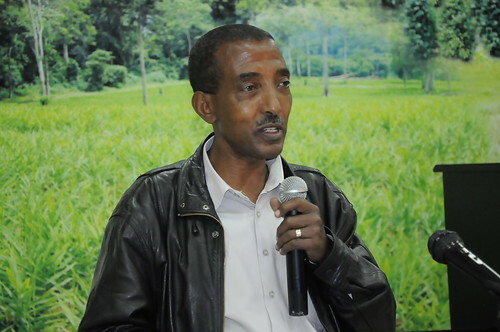 Solomon Abegaz, co-principal investigator (co-PI) in the Ethiopia country team, working with the Ethiopian Institute for Agricultural Research (EIAR), introduces himself and his work with the program. It is one of a series of portraits of key people in Africa Chicken Genetic Gains (ACGG). I have a BSc in animal science, MSc in animal production and a PhD in animal science focusing on animal breeding. I have been working in the research and academic world for the last 30 years, including in offering long-term training. I am the co-PI in the ACGG project in Ethiopia and I coordinate the technical aspects of the project. What is the next piece of work that you are focusing on? We have a number of big activities in the coming two to three months. One is the beginning of the on-farm and on-station studies. We need to make the necessary final preparations to receive the fertile eggs and to prepare the hatchery facilities. We also have to finalize selection of brooding facilities in the different regions and make contractual agreements. The other major endeavor is the next innovation platform meeting: we need to identify participants and make the necessary arrangements for the meeting. In addition to that, we are analyzing the baseline data. I believe that this project can make a difference in the poultry industry in Ethiopia and in the livelihoods of poultry producers, both small and large. In addition I believe that we can make the changes sustainable so they thrive after the project. Those involved in implementing of the project at the national and sub-national level are not working full-time on the project. At times other engagements may get precedence and the performance of project activities may suffer from that. We need to have a discussion with the project management so that some of us are able to work full-time on the project. In addition, careful planning of project activities and other activities should be ensured to avoid overlaps. As I said earlier, the project can have a positive impact on the poultry industry of the country. The choice of the appropriate genotype(s) and the public-private partnership that will be developed are likely to ensure the adoption of high-producing chickens in a sustainable way. The success of the project like (or even more than) other activities requires commitment of those who are involved in it and we need to commit ourselves to succeed. Tags: EIAR, Solomon Abegaz, voices. Bookmark the permalink.